So long and thanks for all the synths! 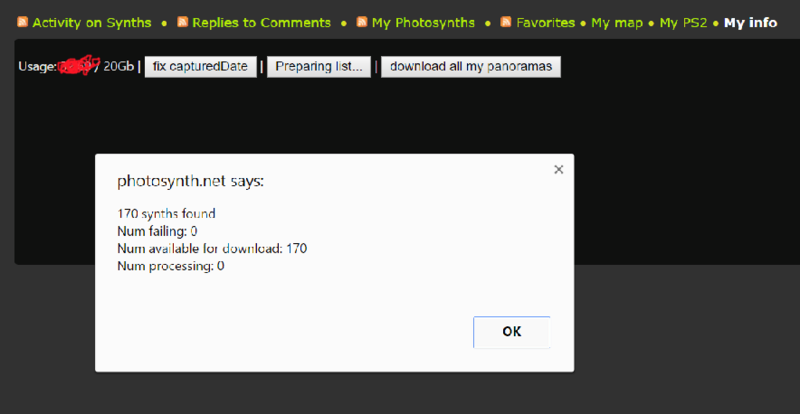 Microsoft is pulling the plug on photosynth.net but they are also very gracefully giving us a way to save all our synths before full shutdown. What is also very generous from them is that they are planning to open-source the viewers (I implemented the latest one) and are providing an offline viewer for panoramas and ps2s (technical preview synths). If you are a heavy user it might take you a while to click export (as explained in original post) and wait to download all your synths. I have a solution for you: I wrote a mass downloader! 1) Install my chrome extension: photosynth website on steroids (or just update / re-enable it). 2) Log-in to your photosynth.net account. When you click on that button in the background it’s going to click on the export button of all your panoramas / synths for you and then return immediately. It might take several hours for photosynth.net to export all your synths. So I recommend you to click on both download panoramas and ps2s and then wait for a couple hours and try again. If everything went smoothly at some point the alert box should tell you that all synths are available (for download) and that none of them are still processing (export in progress) and hopefully none of them are failing. Thus none would be available originally but after a few minutes/hours they should be all there. I assume that you did part one already and you have panoramas_list.txt and ps2_list.txt. I wrote a python 2.x script to mass-download all your synths using the list files. 1) install python 2.x on your machine. 2) create a folder in a hard drive with lots of space (~rougly the same space reported on the “My info” page). The script is supporting resuming, so you can Ctrl+C to cancel the current download list and then call the script again to resume downloading. End of part two: happy downloading! You are currently browsing the archives for November, 2016.